Make your own history as you step back in time at this atmospheric stone mill. 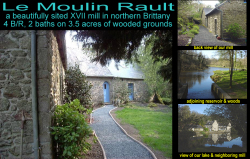 Just two hours from Paris (by TGV) in unspoiled Brittany, 'le Moulin Rault' is wonderfully secluded. Sited in a wooded valley between a peaceful lake and the Gouessant river amidst the lush farms of the French countryside, yet only minutes away from a bustling town (providing all amenities) and the breathtaking beauty of the extensive, pristine beaches of the Emerald Coast. Arrive on the wooded grounds over the gated bridge and take in the gorse-covered hills and the wild rock formations evocative of the Druids who once inhabited this area. Within the house find high ceilings and spacious skylighted rooms with all modern conveniences alongside the original 17th-century mill wheel and stone fireplace. 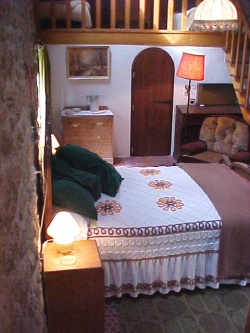 You are conveniently located for easy day trips to medieval towns, picturesque forts, ruined castles, historic churches, marvelous rural or coastal scenery, and a plethora of one- and two-rosette Michellin restaurants. Boat trips from nearby St. Malo can take you to many charming nearby islands.